How green is your film-making? New thinking and new technology are helping our industry become more sustainable in the future. As wildlife film-makers we care about the planet – that goes without saying. And, in our travels around the world, we've all experienced climate change in action. I recently met up with Emma Peddie – a wildlife film Producer who now works as Sustainable Production Advisor to the NHU in Bristol. On 23rd October 2014 she is chairing the Wildscreen session 'Clean, Green and Meaningful TV Production'. More details here. Emma explained that measures to reduce a production's carbon footprint are gathering pace across the industry. The key has been the development – 4 years ago - by the BBC of 'Albert' – an online carbon calculator for TV production. Albert is now managed by BAFTA and used by over 80% of BBC productions to measure their carbon footprints – also signed up are over 1600 individuals from 210 companies … including the big broadcasters BBC, ITV, Sky etc as well as indies. More info. So how do you reduce your carbon footprint? The lion's share of your carbon emissions are going to be produced by your travel to, from and around your location. So one possibility is to hire local crew or send out one crew which works across two or more productions. The BBC already has an in-house shoot share database for productions shooting overseas. One can see how this could work for the same genre of production – but it could be much more tricky across genres. An experienced wildlife crew could cover another wildlife shoot, but could a documentary crew cover a wildlife shoot? But when filming is underway there are now some 'greener' technologies coming on stream. Drones,for instance, can be just as effective for aerials as a fuel hungry helicopter – arguably more so for most situations, and much cheaper too. Already LED panels are rapidly replacing Tungsten lighting because they run cooler and use much less energy – and in the field you may not need a generator at all. 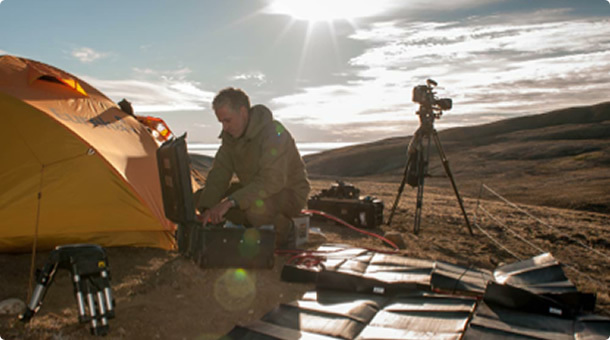 For power on location flexible, foldable solar PV panels, developed for military use in remote locations, can cater for most of your power needs from lighting to charging batteries. The forthcoming BBC production 'Snow Wolf Family & Me' recently used them in the Canadian Arctic and will be sharing their experiences at Emma's Wildscreen session. For more information on the solar panels used by this BBC production, which were supplied by BAE systems, contact jon.woodman@baesystems.com. 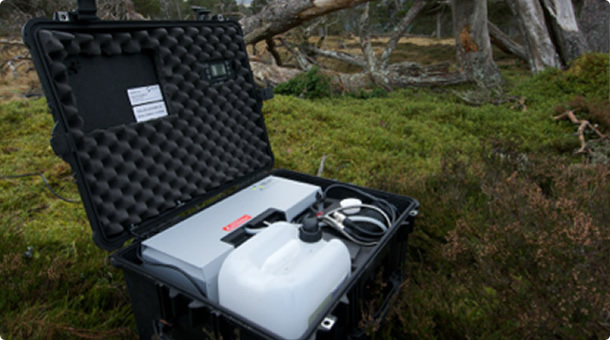 BBC's Springwatch and Winterwatch have been field trialling Methanol Fuel Cells which are already widely used in boats and caravans. They are chemical battery chargers that run silently, need minimal maintenance, and emit virtually no carbon. They have been used to power remote cameras that need to be left undisturbed for long periods and have managed to get some unique footage of eagles, bitterns and grouse at a lek. Tim Scoones (Executive Producer of Spring/Winterwatch) will be talking about their use at Emma's Wildscreen session. There will no doubt be new ideas and more innovations on the way so we can do our bit to cut carbon and build a cleaner, greener world.